Dita gets her Southern on. Valkyrie channels their inner Coney Island. It kills me that this bill isn't scheduled for Seattle. So far...? BSP hot tipper Paul and I have been bemoaning the fact that Dita Von Teese has nothing scheduled at this time for the Pacific Northwest, but she’s bringing a round of incredible acts to New Orleans, Dallas, and Houston this month- including her Opium Den number and…a PINK MECHANICAL BULL. Yes, it’s true. And to make those of us way up North even more jealous, last night Dita announced even more special guests for her Strip Strip Hooray! 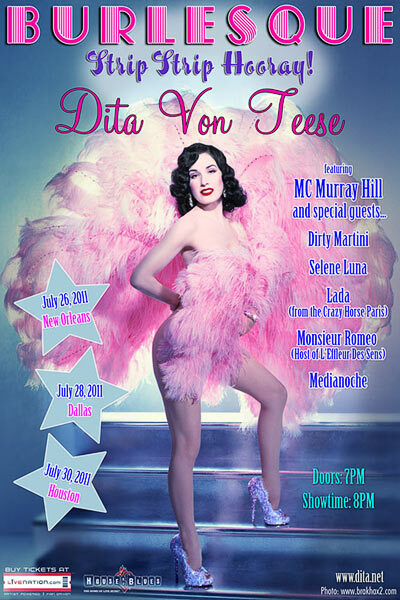 variety show: MC Murray Hill, Dirty Martini, Selene Luna (!!! ), Monsieur Romeo (Host of L’Effleur Des Sens), Lada (from the World Famous Crazy Horse Paris), and Medianoche. Dita is bringing her variety show “Burlesque: Strip Strip Hooray!” to the House Of Blues in New Orleans, Dallas and Houston this summer. Comedian and renowned entertainer Murray Hill, “the hardest working middle-aged man in show business,” is a relentless retro shtick slinger, buster of audience chops and freewheeling ad-libber. Murray’s razor sharp wit and frenetic showman antics led the New York Times to anoint him “Downtown’s New ‘It’ Boy.” Murray has also had a string of recent cameos in HBO’s Bored to Death, STARZ’s Gravity, and BRAVO’s Real Housewives of New York. New York Magazine calls Dirty Martini “the sexpot sophisticate,” and the New York Times declared her “one of the best in burlesque.” Featured in the film “Tournee” which premiered at the 2010 Cannes Film Festival, Dirty Martini is one of the leading figures in the American Burlesque revival. Representing boylesque in the show, Monsieur Romeo was born in France and raised all over Europe where he worked as a model for Giorgio Armani, Vivienne Westwood and Jean Paul Gaultier, before moving to Los Angeles to pursue acting. Well-known as the host of the LA-based Parisian Cabaret L’effleur des Sens, “Monsieur Roméo exudes disreputable savoir-faire, seeking women in the audience to help him strip during his solo, and behaving as if anyone who even looks at him is hopelessly corrupt.” (LA Times). Medianoche was born and raised in southern Spain and is formally trained in flamenco and tango dance. She brings a distinctly European je ne sais quoi to venues such as Duane Park, Highline Ballroom, the Philadelphia Museum of Art, and the Hotel Empire. Although always at her best when emerging from Isis wings, rhinestoned flower petals, or her signature red pheasant feathers, Medianoche also dances Argentine tango professionally in theatres and ballrooms throughout the United States. For more information, please visit www.dita.net. What can we do to console ourselves until Dita turns her attention back to Seattle and beyond? I’d suggest some homegrown burlesque, including the debut show from Valkyrie Productions (aka Minetta Lane and Violet Tendencies). Trojan Original as The Strongman, The Shanghai Pearl as The Mermaid, Fannie Beaverhausen as The Giantess…? Yes, yes, and yes. Dita Von Teese can cool her bejeweled heels in Texas for another weekend or two while Sideshow Sirens: A Valkyrie Peepshow mixes things up, Coney Island style. hottest talent along side Seattle’s much loved queens of the stage. the top with our ideas, but something fun always comes out of it. love to hear about it. Contact Valkyrie at: thevalkyrieproductions@gmail.com, and get tickets HERE. 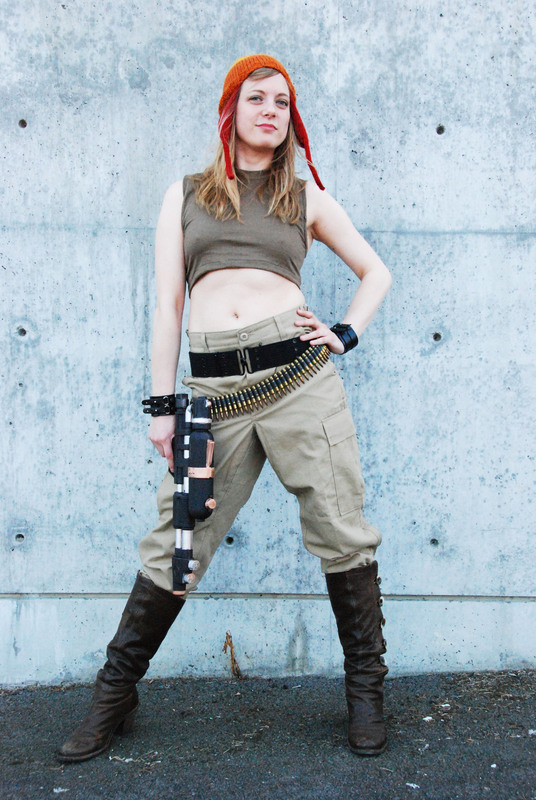 Seattle’s finest geeky burlesque performers are daring to take inspiration from their favorite Joss Whedon shows and characters: Buffy, Firefly, Dr Horrible, Angel, Dollhouse and more. This will be a nerd spectacle of epic proportions. Expect sexiness, silliness, sadness, strange creatures and more. We aim to misbehave! EmpeROAR Fabulous (Sat. Only)…AND MORE! ~ by angrytruffle on 07/14/2011.